Fifty-seven years ago this month, the USAF/Bell X-2 Starbuster rocket-powered research aircraft reached a record speed of 2,094 mph with USAF Captain Milburn G. “Mel” Apt at the controls. This corresponded to a Mach number of 3.2 at 65,000 feet. Mel Apt’s historic achievement came about because of the Air Force’s desire to have the X-2 reach Mach 3 before turning it over to the National Advisory Committee For Aeronautics (NACA) for further flight research testing. Just 20 days prior to Apt’s flight in the X-2, USAF Captain Iven C. Kincheloe, Jr. had flown the aircraft to a record altitude of 126,200 feet. On Thursday, 27 September 1956, Apt and the last X-2 aircraft (S/N 46-674) dropped away from the USAF B-50 motherhip at 30,000 feet and 225 mph. Despite the fact that Apt had never flown an X-aircraft, he executed the flight profile exactly as briefed. In addition, the X-2′s twin-chamber XLR-25 rocket motor burned propellant 12.5 seconds longer than planned. Both of these factors contributed to the aircraft attaining a speed in excess of 2,000 mph. Based on previous flight tests as well as flight simulator sessions, Apt knew that the X-2 had to slow to roughly Mach 2.4 before turning the aircraft back to Edwards. This was due to degraded directional stability, control reversal, and aerodynamic coupling issues that adversely affected the X-2 at higher Mach numbers. However, Mel Apt now found himself in a predicament from which there was no real chance of escape. If he waited for the X-2 to slow to Mach 2.4 before initiating a turn back to Edwards Air Force Base, he quite likely would not have enough energy and therefore range to reach Rogers Dry Lake. On the other hand, if he decided to initiate the turn back to Edwards at high Mach number, he risked having the X-2 depart controlled flight. Apt opted for the latter. As Apt increased the aircraft’s angle-of-attack, the X-2 careened out of control and subjected him to a brutal pounding. Aircraft lateral acceleration varied between +6 and -6 g’s. The battered pilot ultimately found himself in a subsonic, inverted spin at 40,000 feet. At this point, Apt effected pyrotechnic separation of the X-2′s forebody which contained the cockpit and a drogue parachute. X-2 forebody separation was clean and the drogue parachute deployed properly. However, Apt still needed to bail out of the X-2′s forebody and deploy his personal parachute to complete the emergency egress process. But, it was not to be. Mel Apt ran out of time, altitude, and luck. He lost his life when the X-2 forebody that he was trying to escape from impacted the ground at several hundred miles an hour. Mel Apt’s flight to Mach 3.2 established a record that stood until the X-15 exceeded it in August 1960. However, the price for doing so was very high. The USAF lost a brave test pilot and the lone remaining X-2 on that fateful day in September 1956. The mishap also ended the USAF X-2 Program. NACA never did conduct flight research with the X-2. However, for a few terrifying moments, Mel Apt was the fastest man alive. 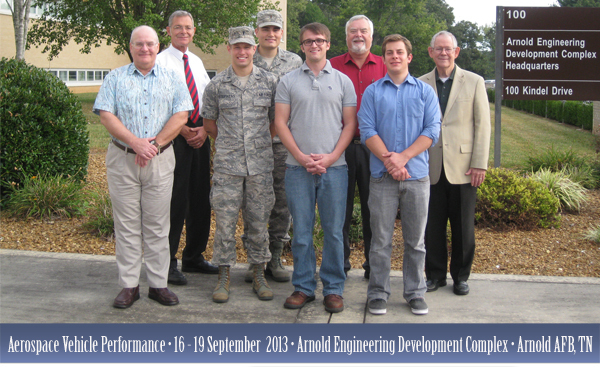 From 16-19 September, Aerosciences instructor J. Terry White taught his Aerospace Vehicle Performace (AVP) course to the fine aerospace professionals at Arnold Engineering Development Complex (AEDC). This is the fourth course Mr. White has taught to AEDC community in the past 13 months, having previously taught his Fundamentals of Hypersonics (FOH) and Basic Missile Aerodynamics (BMA) courses to the organization, which is based at Arnold Air Force Base, TN. The AVP course has been a popular course of late, which seems to be linked with ongoing industry efforts to design more advanced aerospace vehicles. The course provides participants with the knowledge and skills needed to accurately estimate aircraft take-off and landing performance and understand the essentials of proper aircraft design. With these and other simple tools, students are able to estimate the performance of a wide variety of general aviation, commercial, military and special purpose aircraft missions. Mr. White is honored by the opportunity to serve the innovative men and women at AEDC. He and the entire WEA team would like to thank Mr. Don Malloy and Ms. Dee Wolfe, as well as each student in attendance this week. Fifty-seven years ago this month, the USAF/Bell X-2 research aircraft flew to an altitude of 126,200 feet. This accomplishment took place on the penultimate mission of the type’s 20-flight aeronautical research program. The date was Friday, 07 September 1956. The X-2 was the successor to Bell’s X-1A rocket-powered aircraft which had recorded maximum speed and altitude marks of 1,650 mph (Mach 2.44) and 90,440 feet, respectively. The X-2 was designed to fly beyond Mach 3 and above 100,000 feet. The X-2’s primary mission was to investigate aircraft flight control and aerodynamic heating in the triple-sonic flight regime. The X-2 had a gross take-off weight of 24,910 lbs and was powered by a Curtis-Wright XLR-25 rocket motor which generated 15,000-lbs of thrust. Aircraft empty weight was 12,375 lbs. Like the majority of X-aircraft, the X-2 was air-launched from a mothership. In the X-2’s case, an USAF EB-50D served as the drop aircraft. The X-2 was released from the launch aircraft at 225 mph and 30,000 feet. The pilot for the X-2 maximum altitude mission was USAF Captain Iven Carl Kincheloe, Jr. Kincheloe was a Korean War veteran and highly accomplished test pilot. He wore a partial pressure suit for survival at extreme altitude. While the dynamic pressure at the apex of his trajectory was only 19 psf, Kincheloe successfully piloted the X-2 with aerodynamic controls only. The X-2 did not have reaction controls. Mach number over the top was supersonic (approximately Mach 1.7). Kincheloe’s maximum altitude flight in the X-2 (S/N 46-674) would remain the highest altitude achieved by a manned aircraft until August of 1960 when the fabled X-15 would fly just beyond 136,000 feet. However, for his achievement on this late summer day in 1956, the popular press would refer to Iven Kincheloe as the “First of the Space Men”. Sensors & Systems instructor John L. Minor just held his Fundamentals of Unmanned Aerial Vehicles, Missions and Systems (UAV) course at Edwards Air Force Base, CA. 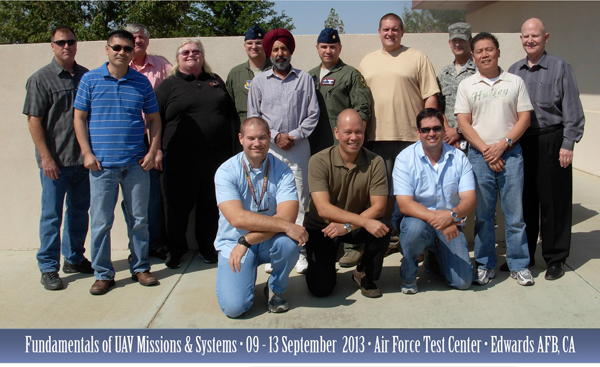 The training was held 09-13 September at the Air Force Test Center(AFTC), which conducts developmental test and evaluation of air, space and cyber systems to provide timely, objective and accurate information to decision makers. Mr. Minor and the entire WEA staff would like to thank Ms. Patricia Jones, Ms. Kathy Finley, Ms. Cathy Clum and each of the wonderful students in attendance. Forty-six years ago this month, the Surveyor 5 robotic spacecraft made a successful soft-landing on the Moon’s Mare Tranquilitatis. Touchdown of the 3-legged lander occurred approximately 15 nautical miles northwest of the future Apollo 11 manned lunar landing site. In preparation for the first manned lunar landing, the United States conducted an extensive investigation of the Moon using Ranger, Lunar Orbiter and Surveyor robotic spacecraft. Ranger provided close-up photographs of the Moon starting at a distance of roughly 1,100 nautical miles above the lunar surface all the way to impact. Nine (9) Ranger missions were flown between 1961 and 1965. Only the last three (3) missions were successful. Lunar Orbiter spacecraft mapped 99% of the lunar surface with a resolution of 200 feet or better. Five (5) Lunar Orbiter missions were flown between 1967 and 1968. All were successful. Surveyor spacecraft were tasked with landing on the Moon and providing detailed photographic, geologic and environmental information about the lunar surface. Seven (7) Surveyor missions were flown between 1966 and 1968. Five (5) spacecraft successfully landed. The Surveyor spacecraft weighed 2,300 lbs at lift-off and 674 lbs at landing. The 3-legged vehicle stood within a diameter of 15 feet and measured almost 11 feet in height. Surveyor was configured with a television camera, a surface sampler and an alpha-scattering instrument to determine the chemical composition of the lunar soil. Surveyor 5 lifted-off from Kennedy Space Center’s Launch Complex 36B at 07:57:00 UTC on Friday, 08 September 1967. The trip to the Moon was provided courtesy of a General Dynamics Atlas-Centaur launch vehicle. The Earth-to-Moon transit time was approximately 65 hours. Immediately after the mid-course correction burn on the second day of flight, a helium tank leak occurred in the spacecraft’s vernier rocket fuel system. This forced engineers to hastily develop a revised retro-braking and landing strategy on the fly to save the mission. Happily, the new descent trajectory worked like a charm as Surveyor 5 successfully landed near the southwestern extremity of Mare Tranquilitatis (i.e., Sea of Tranquility). Vehicle touchdown occurred at 00:46:44 UTC on Monday, 11 September 1967. During Surveyor 5’s first lunar day, a total of 18,006 photographs were taken and 83 hours of alpha-scattering measurements were acquired. The latter accomplishment marked the first in-situ testing of lunar soil. (For that matter, the first in-situ testing of the soil of any extraterrestrial orb.) By Sunday, 24 September 1967, Surveyor 5 was put into sleep mode for its first lunar night. On Sunday, 15 October 1967, Surveyor 5 immediately powered-up upon radio command from Earth to begin its second lunar day of surface operations. The spacecraft took an additional 1,048 photographs and accumulated 22 hours of alpha-scattering data during this period. Following two more lunar day/night cycles, Surveyor 5 operations permanently ceased at 00:04:30 UTC on Sunday, 17 December 1967. The historical record indicates that 19,118 photographs were transmitted during the first, second, and fourth lunar days of the Surveyor 5 mission. Further, the soil composition at the landing site was determined to be quite similar to that of basaltic rock on Earth. In summary, all mission objectives were accomplished. Although seldom remembered today, the Surveyor Program provided America with a wealth of lunar surface information critical to the Apollo Program. Surveyor’s success provided an added measure of confidence in the attainability of a manned lunar landing. Interestingly, Apollo 11, the first manned lunar landing, took place on Mare Tranquilitatis at a point about 15 nm southeast of the Surveyor 5 landing site. Seventy-years ago this week, flight testing of the USAAF/Northrop XP-56 Black Bullet commenced at Army Air Base, Muroc in California. Northrop Chief Test Pilot John W. Myers was at the controls of the experimental pursuit aircraft. The XP-56 (X for Experimental, P for Pursuit) was an attempt at producing a combat aircraft that had superior speed performance relative to conventional fighter-like airframes of the early 1940’s. Towards this end, designers sought to maximize thrust and minimize weight and aerodynamic drag. The product of their labors was a truly strange aircraft configuration. The XP-56 was essentially a hybrid flying wing to which was added a stubby fuselage to house the pilot and engine. Power was provided by a single Pratt and Whitney R-2800 radial piston engine driving contra-rotating propellers. A pusher power plant installation was selected in the interest of reducing forebody drag. Gross Take-Off Weight (GTOW) came in at 11,350 lbs. The XP-56’s wing featured a leading edge sweep of 32 degrees and a span of 42.5 feet. The tiny fuselage length of 27.5 feet necessitated the use of elevons for pitch and roll control. Aft-mounted dorsal and ventral tails contributed to directional stability while yaw control was provided by a rudder mounted in the ventral tail. Under contract to the United States Army Air Force (USAAF), Northrop built a pair of XP-56 airframes; Ship No. 1 (S/N 41-786) and Ship No. 2 (S/N 42-38353). Top speed was advertised as 465 mph at 25,000 feet while the design service ceiling was estimated to be around 33,000 feet. The XP-56 was a short-legged aircraft, having a predicted range of only 445 miles at 396 mph. XP-56 Ship No. 1 took to the air for the first time on Monday, 06 September 1943. The scene was Rogers Dry Lake at Army Air Field, Muroc (today’s Edwards Air Force Base) in California. Northrop Chief Test Pilot John W. Myers had the distinction of piloting the XP-56. As described below, this distinction was dubious at best. Myers actually flew XP-56 Ship No. 1 twice on the type’s inaugural day of flight testing. The first flight was really just a hop in the air. Using caution as a guide, Myers flew only 5 feet off the deck in a 30 second flight that covered a distance on the order of 1 mile. The aircraft registered a top speed 130 mph. While the XP-56 exhibited a nose-down pitch tendency as well as lateral-directional sensitivities, Myers was able to complete the flight. The XP-56’s second foray into the air nearly ended in disaster. Shortly after lift-off at 130 mph, the XP-56 presented pilot Myers with a multi-axis control problem about 50 feet above the surface of Rogers Dry Lake. The strange-looking ship simultaneously yawed to the left, rolled to the right, and pitched down. Holding the control stick with both hands, it was all the Northrop Chief Test Pilot could do keep the nose up and prevent the XP-56 from diving into the ground. Myers attempted to throttle-back as his errant steed passed through 170 mph. The anomalous yawing-rolling-pitching motions reappeared at this point, once again testing Myers’ piloting skills to the max. The intrepid pilot was finally able to get the XP-56 back on the ground. Albeit, the landing was more of a controlled crash. All of this excitement took place in about 60 seconds over a two mile stretch of Rogers Dry Lake. John Myers had certainly earned his flight pay (and then some) for the day. XP-56 Ship No. 2 flew a total of ten (10) flights between March and August of 1944. Northrop test pilot Harry Crosby did the piloting honors this time around. Like Myers, Crosby had his hands full trying to fly the XP56. However, Crosby was able to coax the XP-56 up to 250 mph. Despite valiant attempts to rectify the XP-56’s curious and dangerous handling qualities, Northrop engineers were never able to satisfactorily correct the little beast’s ills. This, coupled with the facts that the XP-56 (1) did not deliver the promised speed performance and (2) was being eclipsed by rapid developments in aircraft technology, the strange aerial concoction became a faded memory by 1945. A final thought. Just why the XP-56 was given the nickname of Black Bullet is not clear. Ship No. 1 was bare metal and thus silver in appearance. Ship No. 2 sported a dark grey and green camouflage paint scheme. The Bullet moniker could be in deference to the bullet-like nose of the fuselage. In the final analysis, the name Black Bullet probably just sounded cool and evoked a stirring image of a bullet speeding to the target!